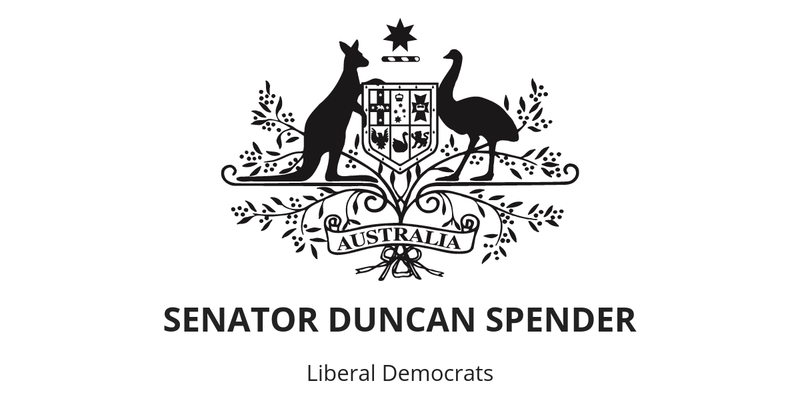 Senator Duncan Spender of the Liberal Democrats has criticised the Australian Law Reform Commission’s Review of the Family Law System. “The Review is anti-Dad,” Senator Spender stated. “Many Dad’s who have lost custody of their children might think that the family law system could not get any worse. Unfortunately they are wrong. “Courts are currently required to presume that, in the absence of child abuse and family violence, it is in the best interests of the child for the child’s parents to have equal shared parental responsibility. The Commission has recommended that this presumption of ‘equal shared parental responsibility’ be replaced with a weaker presumption of ‘joint-decision making about major long‑term issues’. “This would crush any hope that engaged dads have an equal chance of custody compared to engaged mums. “Beyond the breastfeeding period, dads can be as good at parenting as mums. “Contrary to available evidence, it is fashionable to think that a high proportion of dads in break-ups are violent. Unfortunately the Commission has adopted this fashionable groupthink instead of standing up for evidence-based policy and justice. “Acting on the Commission’s recommendations will hurt dads and children. “If re-elected I will seek to block the changes proposed by the Commission. The crossbench needs Senators who will speak truth to groupthink.